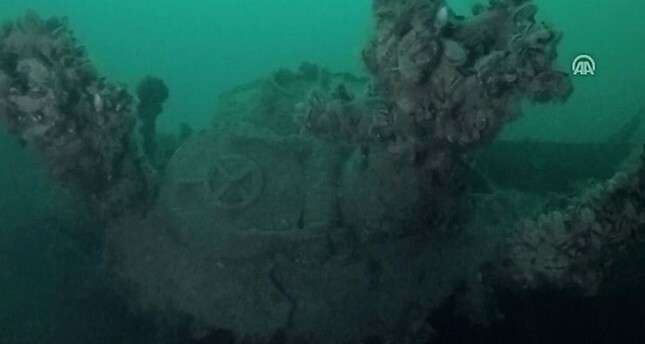 The wreck of a German U-class submarine that sank during World War II was found off the coast of Ağva in Istanbul’s Şile district during a documentary shoot, Report informs citing Daily Sabah. The U-23 submarine was lying at a depth of 40 meters off the Black Sea coast, two nautical miles (3.7 kilometers) away from the shore when it was found by the TCG AKIN search and rescue submarine and scanned the submerged warship with remote controlled devices during an underwater documentary shoot jointly conducted by Turkey’s public broadcaster TRT and the Turkish Naval Forces. During World War II, Nazi Germany requested permission from neutral Turkey to use the straits to transfer their submarine fleet to the Black Sea with the aim of using them in the Operation Barbarossa, the invasion of Soviet Union also joined by their Romanian allies in 1941. The straits were closed to military vessels under the Montreux Convention, therefore the Germans had to carry via land and the Danube the pieces of six submarines, including a U-23 and U-20, from Germany’s Hamburg to Romania’s Constanta where they rebuilt the vessels.